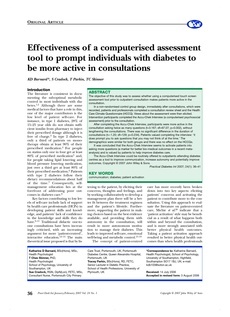 The objective of this study was to assess whether using a computerised touch screen assessment tool prior to outpatient consultation makes patients more active in the consultation. In a non-randomised control group design, immediately after consultations, which were recorded, patients and professionals completed a consultation review sheet and the Health Care Climate Questionnaire (HCCQ). Views about the assessment were then elicited. Intervention participants completed the Accu-Chek Interview (a computerised psychosocial assessment) prior to the consultation. After completing the Accu-Chek Interview, participants were more active in the consultation asking twice as many questions (t=3.167; df=67.07; p=0.002), without lengthening the consultations. There was no significant difference in the duration of consultations (t=-1.20; df=129; p=0.234). Patients valued completing the interview: 'it does prompt you to ask questions that you may not think of at the time.' The demographics were similar for both groups and there was no effect on the HCCQs. It was concluded that the Accu-Chek Interview seems to activate patients into asking more questions (a marker for better bio-medical outcomes in a recent meta-analysis) and is valued by patients to help improve diabetes care. The Accu-Chek Interview could be routinely offered to outpatients attending diabetes centres as a tool to improve communication, increase autonomy and potentially improve outcomes. Copyright © 2007 John Wiley & Sons.